As our long time customers and supporters of our wine you have a role in the following story. Late this summer Ned observed, “There’s some buzz going on about Lazy River.” It is true. Quiet buzz. A growing buzz. From the beginning of our fruit sales in 2002 our clients were notable wineries—Ponzi, Hamacher and Panther Creek among them. It was Panther Creek that gave us our first vineyard designate. The heads of the barrels faced the customers in their tasting room. In various colors of chalk they noted the contents of the barrel was Lazy River wine. Lots of folks remember. We now have seven wineries, six from Oregon and one from California, who bottle with our vineyard designate on their labels. 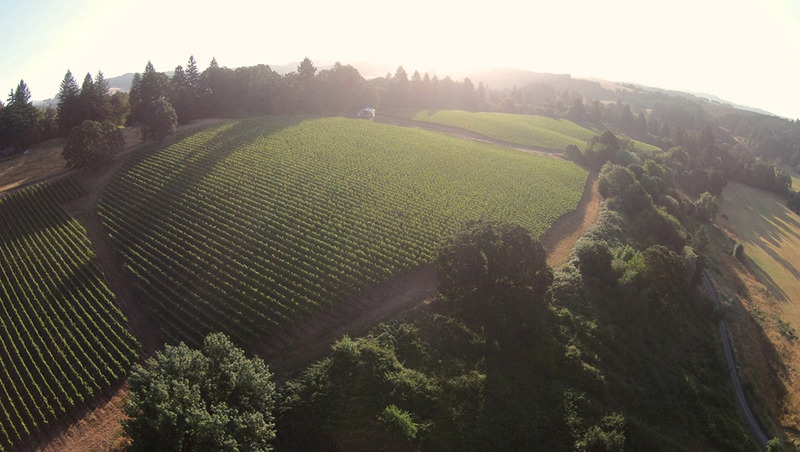 For us this emphatically marks the goal we set in 2000…to have a top Oregon vineyard. Credit goes to the talented management of Buddy Beck and Angel Martinez at Oregon Vineyard Systems. The buzz continued among our colleagues in Oregon. When asked for advice on whose fruit to buy, ours was suggested. They’ve “heard” about the good fruit. Guess what? This year three new labels are using our fruit in their Pinot Noir projects. One of this group, Isabelle Meunier, makes Lazy River Vineyard wines. A French Canadian with winemaker experience worldwide, Isabelle studied with Dominique Lafon, regarded as a European superstar and wizard in the world of Pinot Noir and Chardonnay. As winemaker at Evening Land her wines achieved the most and highest scores (over 95) ever given to Oregon Chardonnay and Pinot Noir. Her new label Lavinea carries Lazy River Vineyard designates. At our November tasting you will taste two LRV wines, the 2014 Pinot Noir and the 2014 Pinot Gris, both made by Isabelle. This summer we’ve seen an increase in the number of groups who ask to come to Lazy River for a tour, wine tasting and the opportunity to buy from an extensive list of LRV wines. Often we also take them on a tour of our winery, The Carlton Winemakers Studio. Ned and I have really warmed to this style of serving customers. We have a bit of food; Ned may make his sorrel omelet. These longer visits enable customers to educate us about our Pinot Noir. A recent visitor and distributor emphasized how much he liked tasting the wines year to year. Really great vineyards reflect their years, change as the wines age and, in his opinion, add more interest to his cellar. Great buzz. For the first time a grandchild, Alden Lumpkin now 15, worked a couple of days with the regular harvest crew. He picked, sorted and spent time at the winery. The regular crew praised his work ethic. Talk about pleased grandparents, we were thrilled to have him move beyond the annual family picking weekend and gain a view into the skills of those men and women who make their livings in agricultural labor. For all of the grands, the vineyard has an irresistible attraction. There are vehicles in which each can practice driving. Ned and Alden disappeared onto the lightly traveled back roads in the VW Thing, an orange jeep style convertible with the LRV logo on the door. It’s humbling to learn a stick shift. Alden is determined to master shifting. The others found the John Deere Gator their machine. A four wheel drive ATV vehicle used for farm work, it kept parents busy riding along as a group of young drivers practiced steering. Georgia, now 13, passed her Grandmother’s driving test and can now be an independent operator. Over the objections of three eight- to- ten year old boys, parents still maintained their place in the passenger seat. Our annual family picking weekend slightly disappointed the crew. The workdays were short, so the grandchildren earned less money. But they had fun. The routine is set. Work followed by lunch at Martha’s in Lafayette, OR (highly recommended Mexican food). In their leisure time, some played Monopoly. We definitely have future capitalists in the family. The evening dinner thundered with laughter. When I read the list of our customers and note the dozens of you who year after year purchase our wine, I am elated. I am particularly pleased that you continue to find our wines interesting and a part of your lives. Thank you. And thank you for sharing the wines. You’ve added to the buzz.